Amazon has easily outpaced the stock market at large in recent months. Now the retailer is closing in on another record, less than a month after setting its last. Amazon is up more than 1% in trading Wednesday, closing in on a new high. Shares set their previous record of $US1,498 after gaining more than 6% on estimate-topping earnings on February 2. The company has escaped the volatility that rocked markets earlier this year relatively unscathed, and has easily outpaced the benchmark S&P 500. It’s up 25% year-to-date, compared to the S&P 500’s 1% gain. Amazon has been rapidly diversifying its business lines, with significant investments in cloud computing, healthcare, and groceries – all of which have taken significant chunks of market value away from competitors. Even in its flagship e-commerce division, there is still plenty of room to grow. 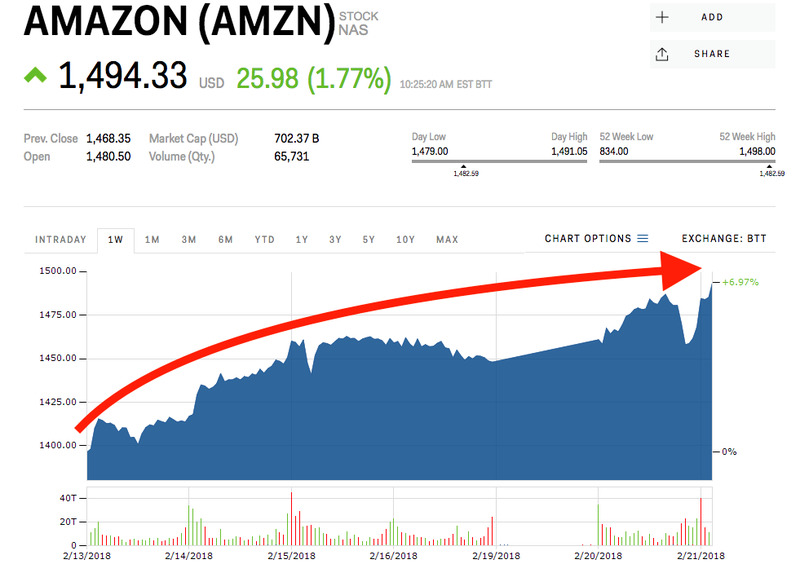 Shares of Amazon have gained 73% in the past year.